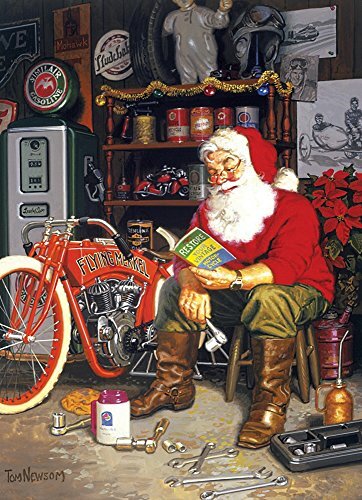 Are you stuck for holiday gift ideas for your favorite motorcycle enthusiast? 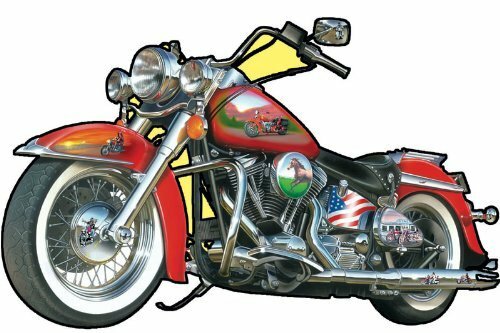 Motorcycle jigsaw puzzles, an old fashioned gift idea, can provide hours of entertainment and distraction for bikers as they wait out the long, cold, winter months until they can get their bikes back on the road again. Puzzles appeal to all ages and they are perfect for spending quality time with the whole family. When the puzzles are complete, they look amazing hung on the wall as a piece of art. 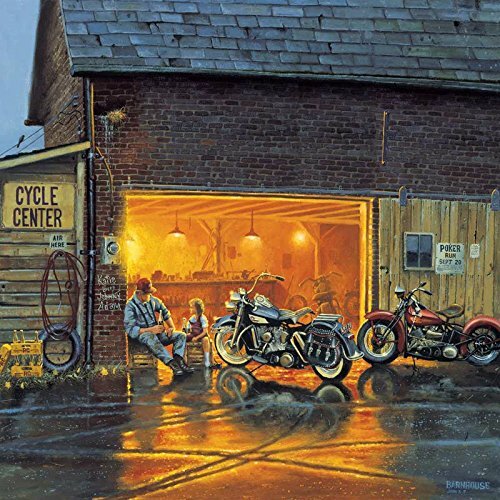 I love spending my leisurely time in the winter putting together puzzles with my grand kids and I am excited to share some of my favorite motorcycle puzzles for bikers and Harley Davidson lovers with you. 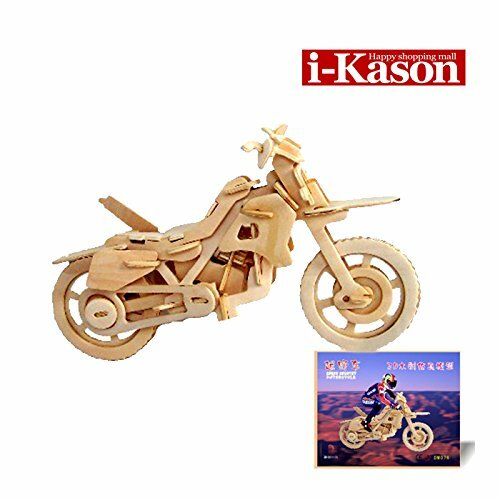 Below, you will find a selection of 500 to 1000 piece motorcycle jigsaw puzzles, 3D wooden motorcycle puzzles, roll-up puzzle mats and a puzzle storage table (how awesome is that? ), as well as jigsaw puzzle glue for mounting the puzzles on a wall. I am sure most of you have spent endless hours at some point in your life assembling some pretty amazing Jigsaw Puzzles. It even becomes entertainment for your guests. 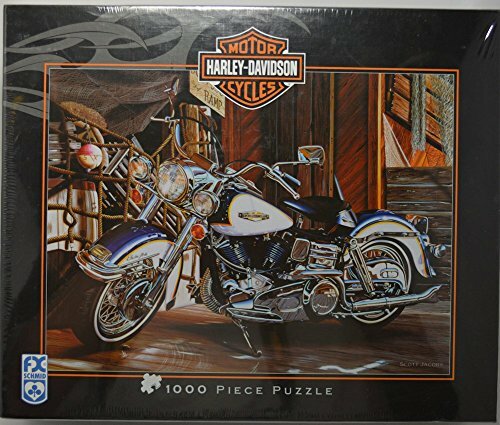 Fortunately for our motorcycle lover, there is a wide variety of motorcycle and Harley themed puzzles. Jigsaw photo puzzles are a small puzzle, usually 8 inches by 10 inches in size and containing 110 pieces OR 11 inches by 14 inches and containing 252 pieces. 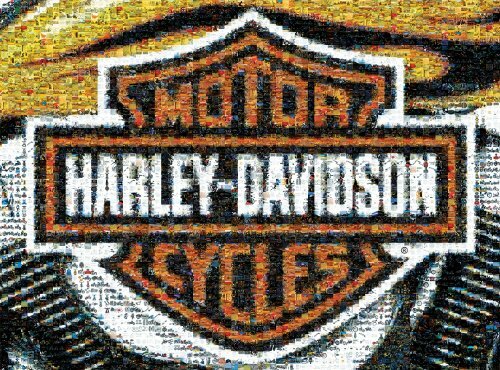 Pick from one of the pre-made Harley Davidson jigsaw puzzles, or create your own photo puzzle by uploading your favorite personal custom motorcycle pictures. Add personalized text, like your name, location the picture was taken, or the date of the motorcycle event. Add your favorite biker quote, or song lyric. What a way to commemorate the memories of an amazing road trip! The puzzle pieces are sturdy and colorful. 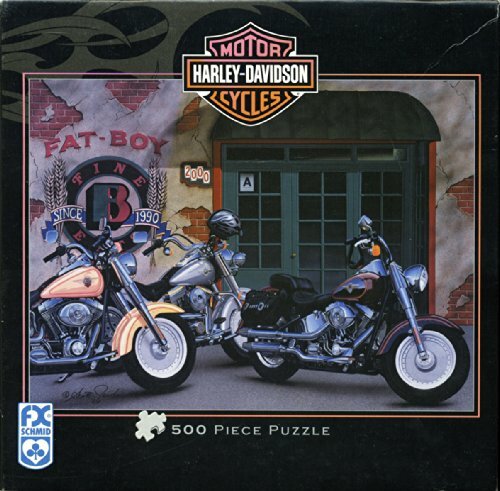 These amazing motorcycle jigsaw puzzles come in a duraable gift box with the puzzle image printed on the lid. This would be a wonderful gift idea for a special someone in your 2 wheel world. 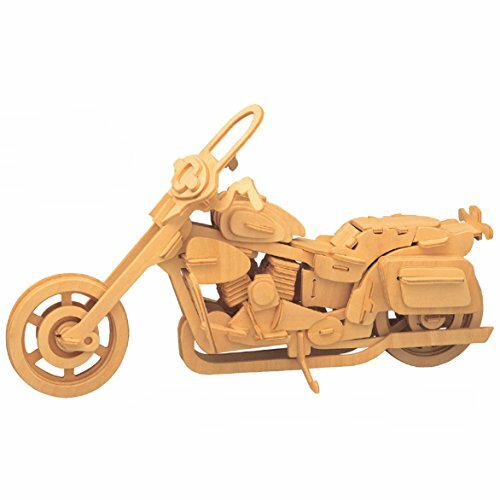 Custom made and personalized, these are amazing motorcycle puzzles for a biker. 500 piece Motorcycle puzzles are what I would call semi challenging. They make great gifts for those who just don't have the attention span to work on larger puzzles. 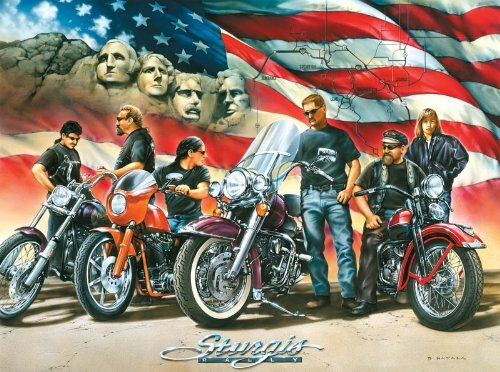 Who can forget their first road trip to Sturgis bike week? 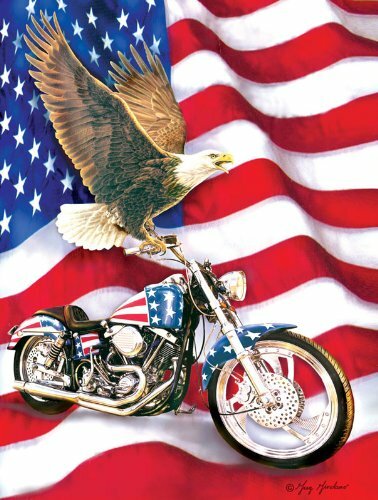 Biker themes run from old school Harley choppers, the American symbols of the bald eagle and the Captain America bike. 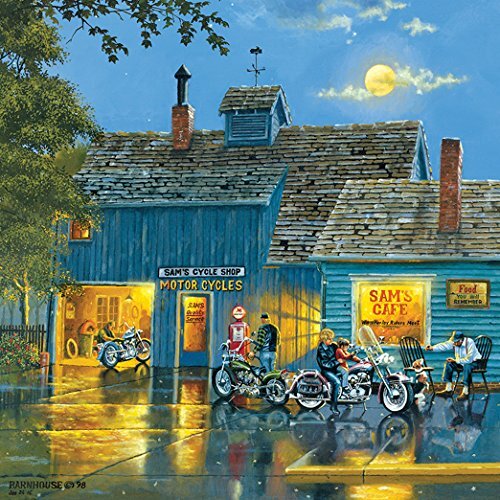 Motorcycle lovers can re-visit the 50's charm of old corner stores and gas pumps reminding us of the simpler, quieter small town. Of course motorcycles are the star subject. This is such a thoughtful gift to give to your biker friend. 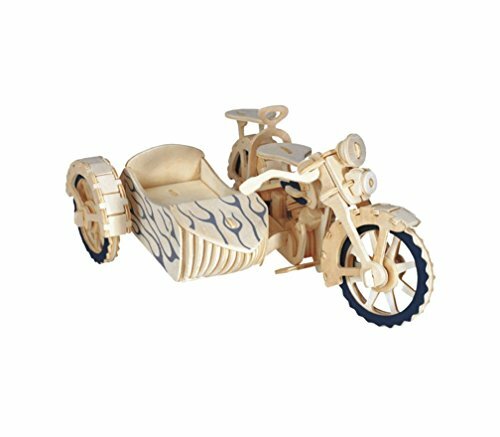 500 piece motorcycle puzzles can be created by children from the age of 6 to 96. Families love working on these together. These interlocking works of art tickle the brain, keeping us sharp and our visual spatial abilities can actually improve by doing jigsaw puzzles. 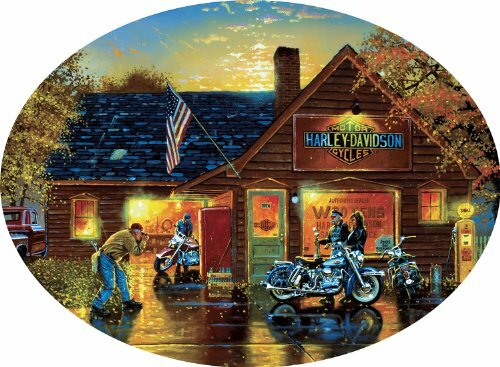 750 to 1000 piece Harley Davidson puzzles are the ultimate challenges. Time flies when you tackle these jigsaw beauties. Your bike is polished, the snow or rain is falling and you are tired of re-runs on TV. Why not lose yourself in creating a stunning work of art. Subjects include everything from a photomosaic Harley insignia to Norman Rockwell type of Christmas puzzle. 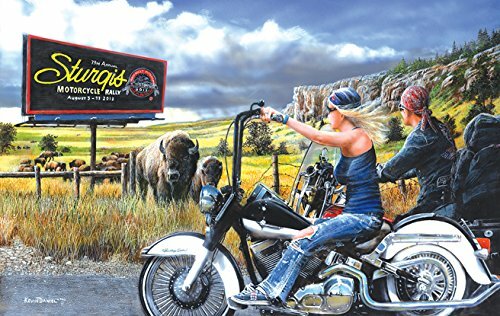 They bring back fond memories of your first trip to Sturgis, or the feeling of history as you traveled down the famous Route 66. 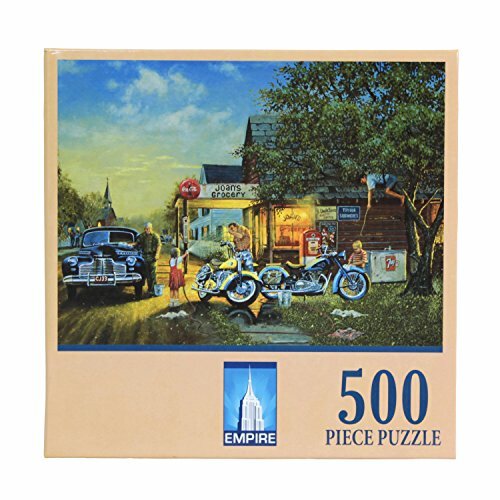 Customers can find rectangular or shaped puzzles. 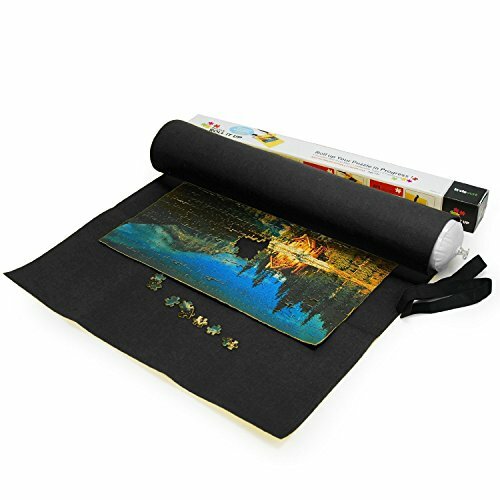 Most are made out of recycled board or cork-board and are finished with high quality inks. I have actually lost hours while sorting pieces into color groups and constantly referring to that all-important box to guide my puzzle placement. What an exhilarating feeling as you see the product of your attention coming together. 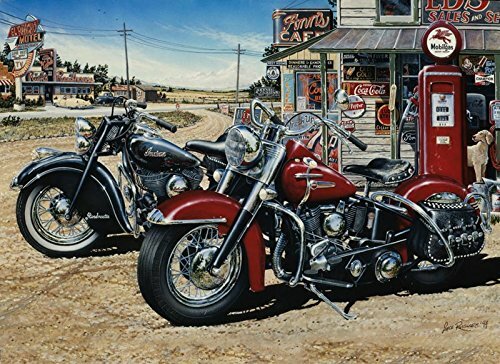 These are my personal favorite Motorcycle Puzzles for a Biker or Harley Lover. 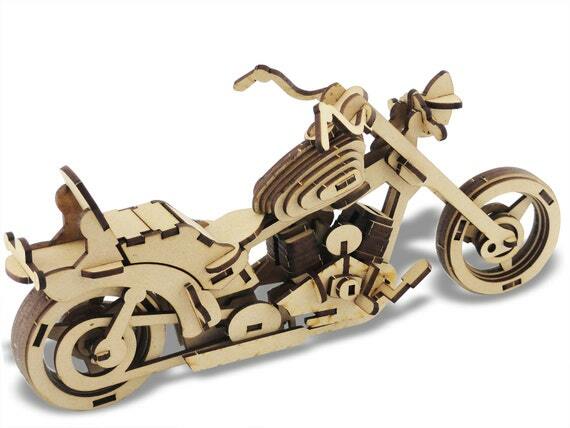 3-D puzzles can impart the love of woodworking to the young biker fan. Adult and child will create amazing memories together. Children can learn the parts of a V twin motorcycle engine, and this knowledge will also bolster their interest in all things motorcycle. The accomplishment of completing this project is a bolster to self esteem. Models, when complete can be finished with lacquers or painted. therefore, they become truly unique artworks. 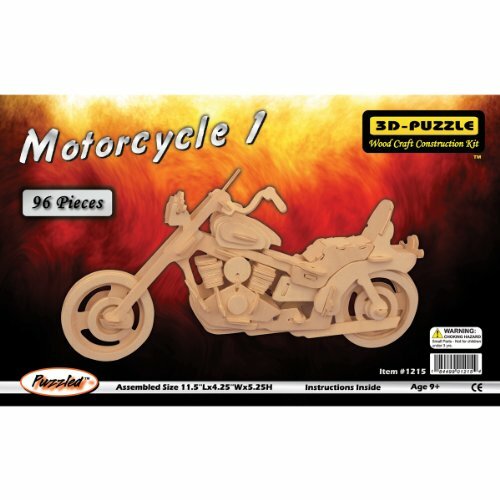 Finally, these puzzles can be an inital step to the progression of building of more advanced model scale motorcycles. 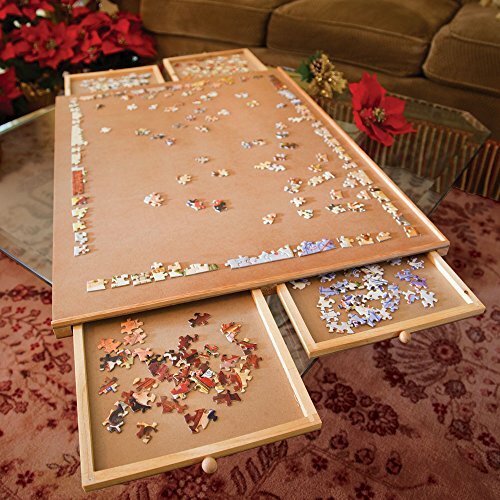 Roll up felt mats and storage tables make storage of your incomplete puzzle a breeze. Your pieces stay where you left them and your completed portion stays that way until you slide it onto a board for preservation. 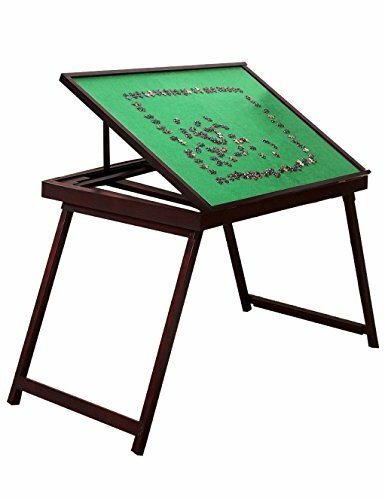 I always used the felt mat, but I saw this wooden jigsaw folding table and thought it was the best idea ever! It has now gone on my wish list for winter puzzle projects. Using the wooden board with the sliding drawers to keep your sorted puzzle pieces organized is brilliant. When your puzzle is complete, you can simply apply jigsaw puzzle glue to seal to your hanging board to preserve all your hard work. Of course, Motorcycle Puzzles for a Biker or Harley Lover deserve a sealing compound that will ensure all your hard work will be held together for years and years. 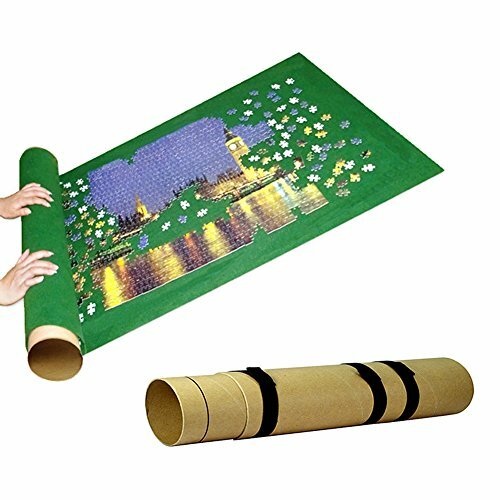 Some choices for gluing your jigsaw picture together include the old fashioned brush-on glues as shown below, or my personal favorite, the peel and stick puzzle saver. The peel and stick method is applied to the back of the completed puzzle. It is a super easy method and also includes stick-on hangers to enable your project to decorate that special spot on the wall. Customers have reviewed these products and the peel and stick puzzle saver is also the highest rated method of preservation. Petaloo Pro Jigsaw Puzzle Glue, 4-Ounce, Mega Puzzles Save-a-Puzzle Glue, 8 Oz Springbok Jigsaw Puzzle Saver Glue Puzzle Presto! Peel & Stick Puzzle Saver: The Original and Still the Best Way to Preserve Your Finished Puzzle! 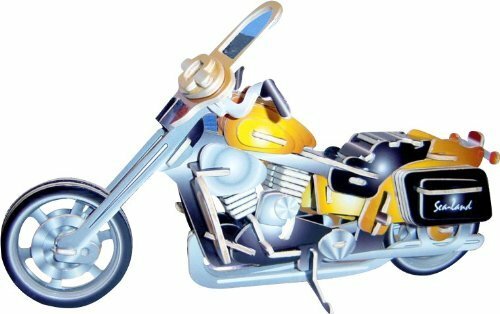 Thank you all for reading my article on Motorcycle Puzzles for a Biker or Harley Lover for a Biker. I hope you found my post informative and interesting. I appreciate hearing from you and would like ideas about any motorcycle related items that I could write about in future posts. Don't forget to check back in for new updates and blogs.